About a third of all the heat lost in an uninsulated home escapes through the walls. Heat will always flow from a warm area to a cold one. In winter, the colder it is outside, the faster heat from your home will escape into the surrounding air. Most houses built from the 1990s onwards have wall insulation to keep the heat in, but if your house is older than that it may not have any wall insulation. If this is the case then you may be heating the outside air, instead of just heating your home. Most types of wall can be insulated in one way or another. If you have a typical house with cavity walls, you could save up to £160 per year in heating bills just from insulating the walls. The first thing you need to find out is what sort of walls you have. Generally these houses don’t have a cavity to fill, but it may be possible to insulate them in the same way as a solid wall. However, you may need a specialist company to insulate a non-standard wall. For further advice or to find an installer who can help you, contact the National Insulation Association. If your home was built after 1920, the chances are that its external walls are made of two layers with a gap or cavity in between. Cavity wall insulation fills that gap, keeping the warmth in to save energy. It can also help reduce condensation inside the house if this is a problem stemming from your external walls. • Its external walls are unfilled cavity walls. • Your cavity is at least 50mm wide. 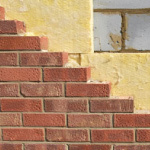 • The masonry or brickwork of your property is in good condition. • It is more than 10 years old (most newer houses will have insulation already). Are your cavity walls filled? • Ask a registered installer for a boroscope inspection. 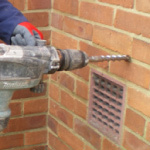 The installer will drill a small hole in your external wall to see if your walls are hollow or filled. • Check with your local authority’s building control department. Are your external walls accessible? Cavity wall insulation Scotland. Cavity wall insulation is blown into the cavity from the outside of a house. Every part of the wall must be filled with insulation, so it’s important that the installer can reach all your external walls. If your home’s external walls are joined to another house, the installer will need to insert a cavity barrier to contain the insulation, so your neighbours aren’t affected. What if your house is damp? If you have any damp patches on your internal walls then they should not be insulated until the problem is resolved. Speak to a builder who specialises in damp prevention. To insulate your cavity walls, the installer drills small holes around 22mm in size at intervals of around 1m in the outside wall of your home. The installer then blows insulation into the cavity using special equipment. Once all the insulation is in, the installer fills the holes in the brickwork so you’ll barely notice them. Filling cavity walls is not a job you can do yourself, you will need to employ a registered installer. A professional can do the job in around two hours for an average house with easily accessible walls. It should not make any mess. What is insulation made of? 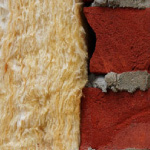 Cavity wall insulation can be made from three types of material: mineral wool, beads or granules, or foamed insulants. All three are manufactured according to British standards. Foam insulation systems should be certified by the British Board of Agrément and installed according to strict guidance laid out in the associated certificates. Read more at the Cavity Wall Insulation Scotland British Board of Agrément site. The variable options of Cavity Wall Insulation Scotland at first glance may appear complex, but in fact our advisers can determine very quickly which insulation will benefit you & the property you live in. Call our Cavity Wall Insulation Scotland information line for details 0800 6906909 or use our contact page and start saving money immediately.